For my main sentiment, I chose the Lovely die cut from Heidi Swapp and layered some clear Wink of Stella over the top for shimmer. 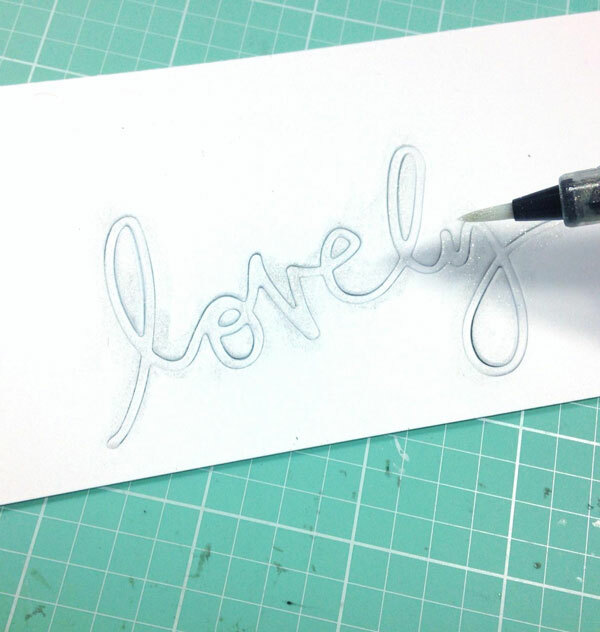 Leaving the die in the cardstock makes it easy to cover the entire piece without the risk of it tearing. 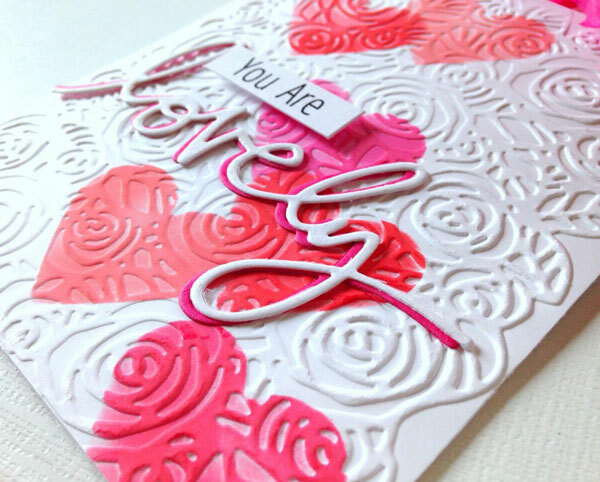 I embossed a 4.25 x 5.5” white card panel for my sentiment, using the Texture Fades Roses embossing folder from Sizzix/Tim Holtz. 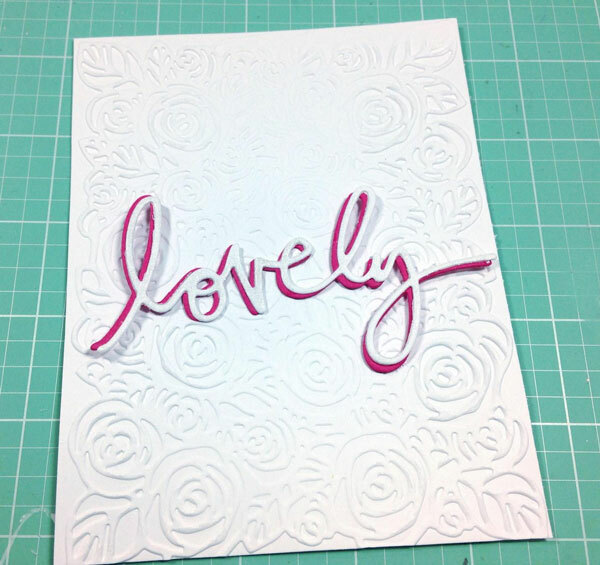 I glued another “lovely” behind my shimmery one in dark pink so the sentiment would stand out on my white card panel. Using the die cut as my guide, I blended some hearts onto the panel above and below in various shades of Distress Oxide—Festive Berries, Worn Lipstick, and Picked Raspberry. 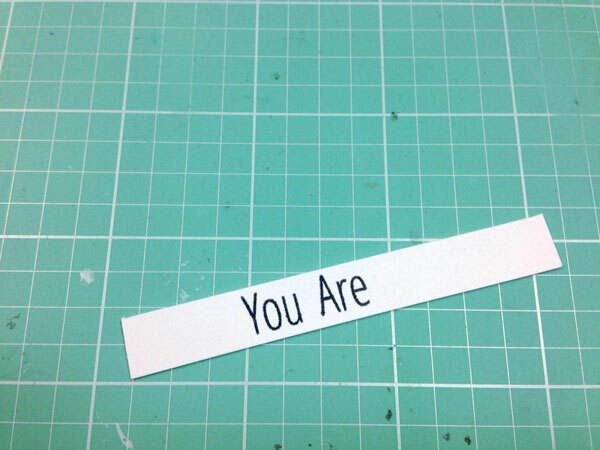 I created the hearts using a simple heart I punched into some scrap card stock. I love the way the ink highlights the embossed images. 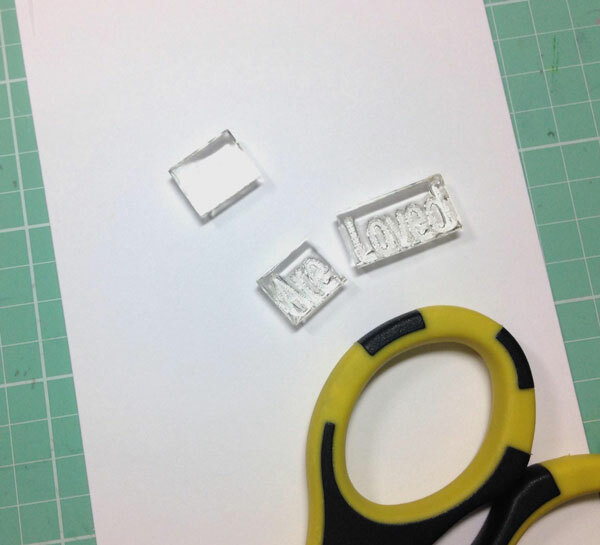 If you have different sized heart punches or dies to make the stencils, those would look great too! 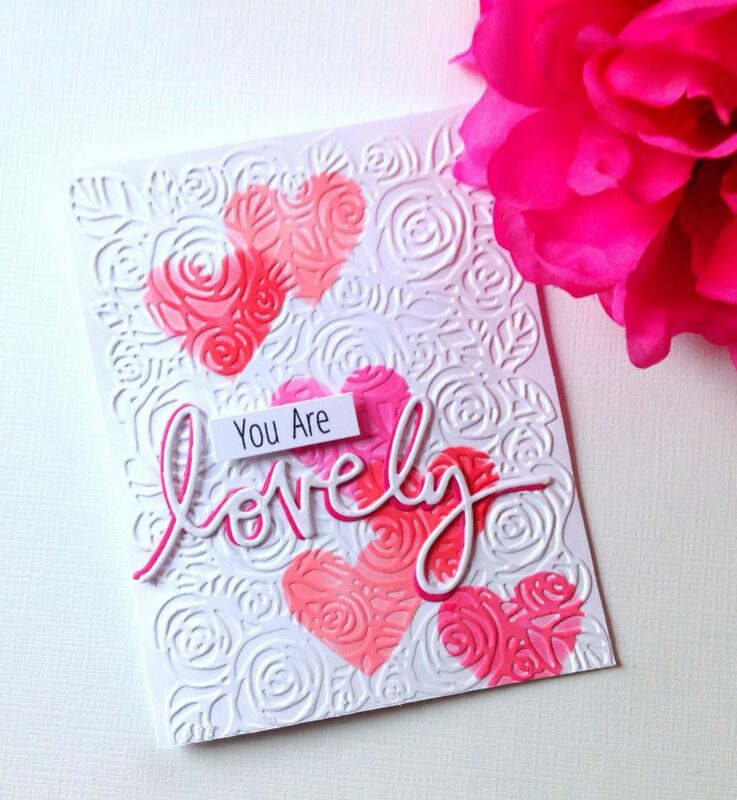 I needed a really small sentiment to accompany my “lovely”, so I created one by cutting apart a stamp from Avery Elle’s Simply Said, You stamp set. 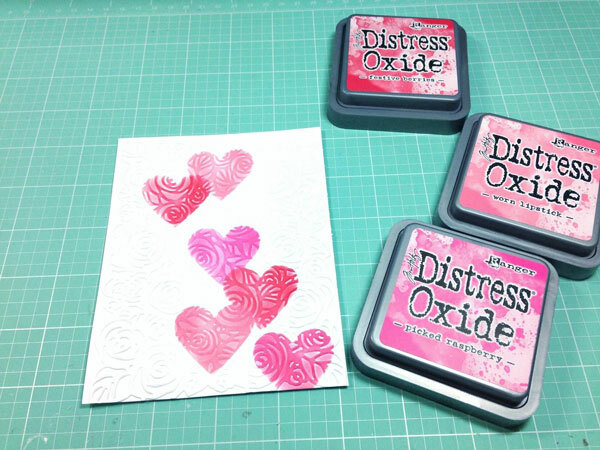 Doing this makes it so easy to customize and make the most out of your sentiment stamps. You can fit the original stamps right back together to use them just as they were, so you aren’t doing any damage to them. I adhered the entire panel onto a white notecard using my Creative Station adhesive machine. 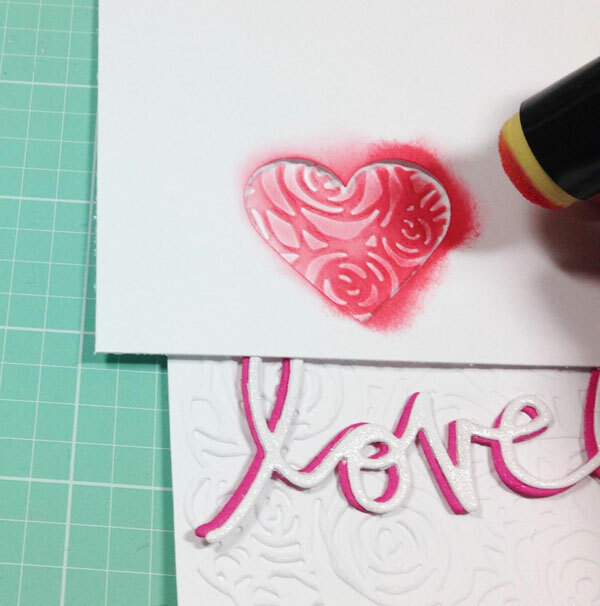 The ink blended shapes are such a pretty way to highlight the dry embossing. Thanks so much for joining me today!